Located in the west-central region of England, the Cotswolds is 90 miles long and 25 miles across. Known for its beautiful hills and lush scenery it is one of the most magnificent areas in the UK. The Heart of England consists of Oxfordshire, Gloucestershire, Wiltshire, Somerset, Warwickshire and Worcestershire counties. 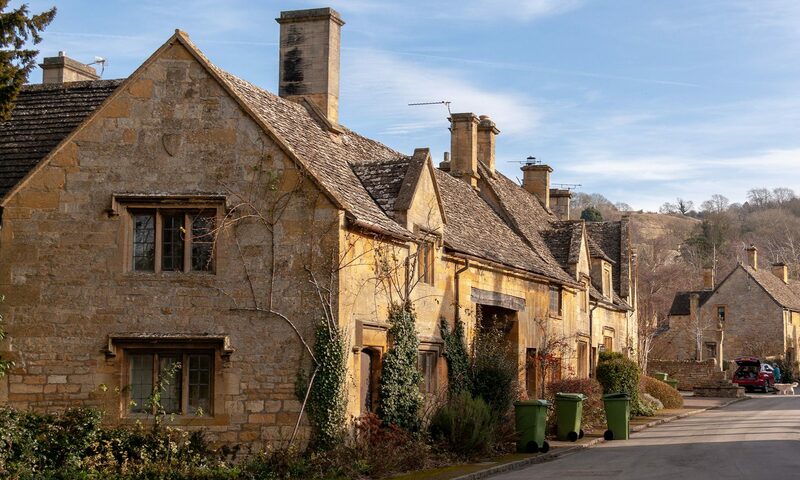 If you have been thinking about surprising your partner with a weekend getaway, pack your bags and head to the Cotswolds as it has some of the most delightful B & B’s in Britain. These are my personal favourite five and, although they may be popular, you are guaranteed to have some of the nicest B & B stays of your life! Painswick is just a two hour drive from London and is known as the gem of the Cotswolds. Featuring limestone buildings that date back to the 16th century, it is home to one of the most popular Bed and Breakfasts in the UK. Byfield House proprietors Brett and Jill Hutton welcome guests and will make you feel like you are part of the family. If you are unsure of the area they can help you find antiques in the village, or point you in the right direction for an afternoon walk. Stay in the charming Garden Suite. Enter through your own private entrance and have a cup of tea in the delightful garden. Fully self-contained, the suite has a fully-equipped kitchen. Bring the family and stay on the second floor which has a second bedroom available. Take a walk and explore the village and have a bite to eat at a traditional English pub. The name says it all, and if you are looking for a romantic getaway in Ebrington for you and your better half spend a weekend at Kissing Gate. Upon arrival you will be treated to afternoon tea. Kick up your feet in the sitting room and decide how you are going to spend your time at Kissing Gate. You can relax on the patio with a glass of Pimms, or warm your toes in front of the cosy fireplace. Challenge each other to a game of Scrabble in the conservatory or take a walk through the beautiful garden. After a good night’s sleep you will be treated to a traditional breakfast. Expect locally grown produce with a full range of breakfast items to choose from. If you hire a car you will be able to spend the afternoon driving around the Cotswolds before you head back to your B & B.
Shakespeare fans will undoubtedly know that Stratford-upon-Avon was the writers old stomping ground and if you want to walk in his famous footsteps, book your holidays at Bowers Hill Farm which is only twenty minutes away. Owned by the Bent Family since 1904 this delightful B & B is the perfect accommodation for you and your family. To this day Martin and his wife Sarah make sure that every guest feels right at home on the farm. Every room features a comfy bed, and families are also accommodated for. When you get up in the morning you will be treated to a full English breakfast which features locally sourced food including pork sausage, succulent bacon, tomatoes ripened by the sun and delicious eggs from the hens that call Bowers Hill home. Indulge in fried bread, black pudding, porridge and scrumptious French toast. The B & B also serves fresh fruit, yogurt and cereals. Lovingly restored in 2007 this luxury Bed and Breakfast used to be an old post office, hence the name. More than a B & B, The Old Post Office serves delicious dinners that only source locally grown meat, fruit and vegetables. Upon request proprietors Christopher and former chef Nicola will prepare you a delicious two or three course supper. Of course if you would like to get out and about The North Cotswolds has plenty of gastro pubs, eateries and restaurants to satisfy your appetite. Breakfast is served in the main dining room and offers guests delicious home-made scones, pastries and even porridge and kippers. Do not be surprised if you wake up to Eggs Benedict and bacon with fried tomatoes and toast. Situated in Adlestrop, The Old Post Office is ideal for walkers. Take a tour of the old church or explore the Gloucestershire countryside. If you feel like relaxing, book a massage at the Hay Barn or opt for a body wrap or scrub. Although most people like to relax on their holidays you can take a cooking class at Davleford Organics farm shop. Turkdean is home to this delightful cottage style Bed and Breakfast which offers guests the modern comforts of home in a unique and traditional cottage setting. Anytime of the year is perfect at Yew Tree. Enjoy a cup of tea in the garden during the warmer months and snuggle up in front of the open fire in the winter. This recently refurbished cottage provides visitors with a relaxed atmosphere and authentic home-style English cooking. You can expect home-caked cakes and breads using only the freshest local ingredients. There are quite a few local pubs and eateries where you can enjoy a bite to eat if you prefer to get out and enjoy the day. Yew Tree Cottage recommends the Horse and Groom, The Fox Inn and The Golden Ball among many others. If you do decide to dine in let the owners know ahead of time as they can prepare a delicious supper. Although only one main dish is served you can choose from traditional Steak and Kidney Pie, Pork Cutlets, Beef Stroganoff or Roast Lamb. If you fancy splashing out on accommodation then Cowley Manor near Cirencester and Cheltenham is a place a supreme luxury. A more traditional place would be The Fleece Inn – a 15th century inn with a scriptures of history. If you have been dreaming about the Cotswolds consider hiring a car for the trip. You can tour the countryside and indulge in activities that would be impossible if you travelled by tour bus. Spend the afternoon at the shooting range or shop for antiques in the local shires. Take the family to the Cotswold Wildlife Park where you can get up close and personal with birds, reptiles and mammals. Cotswold is called the Heart of England for different reasons, but the only way that you can find out why is to discover them yourself.